The Melbourne Demons are playing finals for the first time in more than a decade, after overcoming the West Coast Eagles to win by 17 points. It’s a simple equation for both sides today: win and you’re in. With two contrasting game styles and perfect weather conditions on a pristine football field, this one shapes as a potential match of the season. Join The Roar for live scores and a blog of the match, live from Optus Stadium, starting from 3:20pm AEST. 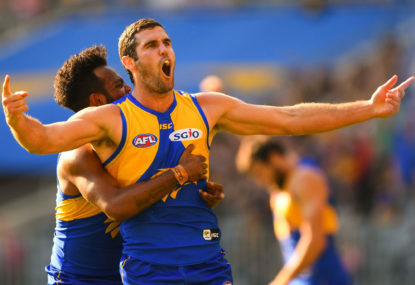 For West Coast, a win guarantees them a top two finish and a home qualifying final against either Collingwood, Hawthorn or Sydney, and an opportunity to be a bit choosy at the selection table next weekend. A loss would see their No.2 seeding come down to the final round, though they’d still need to lose to the Brisbane Lions for that to come to pass. For Melbourne, a win guarantees them a finals spot as it would see them move a full game plus ten goals of percentage over Geelong in eighth. It also, incredibly, puts a top-four finish in the frame should they salute against the GWS Giants in Round 23 and Collingwood (somehow…) lose against Fremantle. Even without a Dockers win Melbourne could still finish as high as fifth. A loss means seventh is as high as they can finish, and they’ll be duking it out with Geelong, Port Adelaide and North Melbourne – the latter needing to win later on today against the Adelaide Crows. In short, this looms as a season-defining game for both teams, and I’m thrilled to be making my live blogging debut in such compelling circumstances. Where today promises to be most interesting is the tactical battle. West Coast has made its dough playing the kick-mark game, controlling the pace of play and using their skills to carve teams up on the outside. The Eagles like to use the full width of the ground, creating angles and attacking lanes that are hard for zone-based schemes to counter. Melbourne, in stark contrast, play the AFL’s equivalent of the grid iron I-formation. It is numbers at the coalface and a stacked centre corridor, leaving the wings open to break once possession is won. Whomever can impose their style on the opposition for more of the game will have the upper hand. It’s a delightful Perth spring day – though it’s still winter of course – with nary a cloud in the sky, a light Easterly breeze and temperature in the mid-20s. These may not have been the conditions football’s Victorian founders saw regularly, but there is little doubt they are the best conditions to play in. Both teams are down a spearhead and an A-class midfielder – Josh Kennedy and Andrew Gadd, and Jesse Hogan and Jack Viney respectively – but otherwise look in as good a shape as you could expect a club to be with two home and away games remaining. All signs point to an excellent afternoon ahead. Melbourne has a goal-and-a-bit head start over West Coast on most markets, a relatively low mark all things considered given West Coast is 9-2 with a percentage in the 130s at its new home ground this season. All signs point to an Eagles victory for mine, though should the Dees get the game they want – heady, bullocking and frantic – then they are in with a mighty shout. West Coast by 24 points. As an economist, Ryan seeks to fix the world's economic troubles one graph at a time. As a sports fan, he's always looking one or two layers beneath the surface to search for meaning, on and off the field. You can follow Ryan here.